What size pool is the most popular? The 2 most popular sizes are 24’ and 27’ round. If space is limited, we have them as small as 16’ round. We advise you taking a tape measure in your backyard and measure out the size you are considering. Pools always look much bigger when they are drawn out. If you prefer, we can arrange a site evaluation to do this for you. Round Radiant pools are less complex and easier to install. Oval pools offer sizes that give you more overall length for swimming, but require a cement footer. 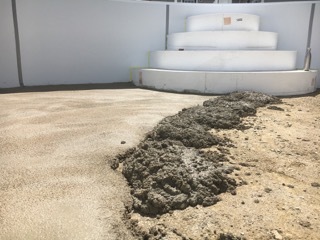 This means a cement truck will be needed pool side during the installation process. Because of their complexity, oval pools also cost more. What should you consider for your pools location? 1. An area with good drainage is a must. 2. We install our pools on a 12” compacted gravel base, then put a vermiculite base down for the liner to rest on. 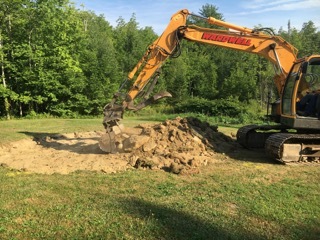 We will need access to get an excavator, dump truck and possibly a cement truck to the pool site. 3. 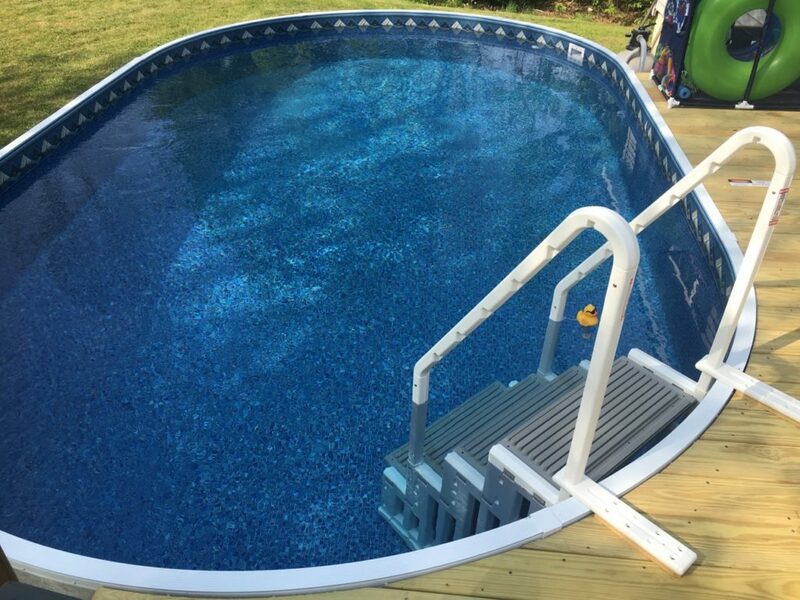 If you are putting your pool near an existing deck, the Radiant Pool can be buried to match up to your existing deck elevations. 4. You might need a fence. In most cases if your pool remains 100% above ground 52”, a fence is not required. If you bury it at all you’ll probably be required to install a fence. You will need to check with your insurance company and your town. What is a Vermiculite base? Most pool companies install above ground pools with a sand bottom under the vinyl liner. They use sand because it’s less expensive. Sand bottoms move and create an uneven surface over time. An uneven surface makes vacuuming the pool more difficult and allows rocks to work their way up. 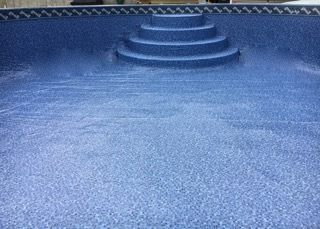 We install all of our Radiant Pools with a vermiculite base. Vermiculite is a natural insulator, which means you have insulation in both the walls and floor of the Radiant Pool. Our vermiculite and cement mix gives you a strong, smooth bottom that stays flat and extends the life of the liner because no rocks will be poking through. You will find that all vinyl lined inground pools are installed with a vermiculite bottom. You have chosen a Radiant Pool because you want to go with the best pool available. We feel that with that decision you deserve the best installation available! What is the Radiant Pool Warranty ? Your Radiant Pool comes with a 100% lifetime warranty, that’s never prorated/fully transferable for the life of the pool. It even covers winter damage. Stairs – a s grand as the new Geofoam inside steps or as simple as Step1. Both make getting in and out of the pool easier than a traditional A-frame ladder. Solar Blanket – Everyone loves a warm pool. By using a solar blanket at night, you will raise your temperature 10 degrees on average. Chlorinator – Makes it easier to maintain a chlorine level and is less corrosive on your pools equipment. 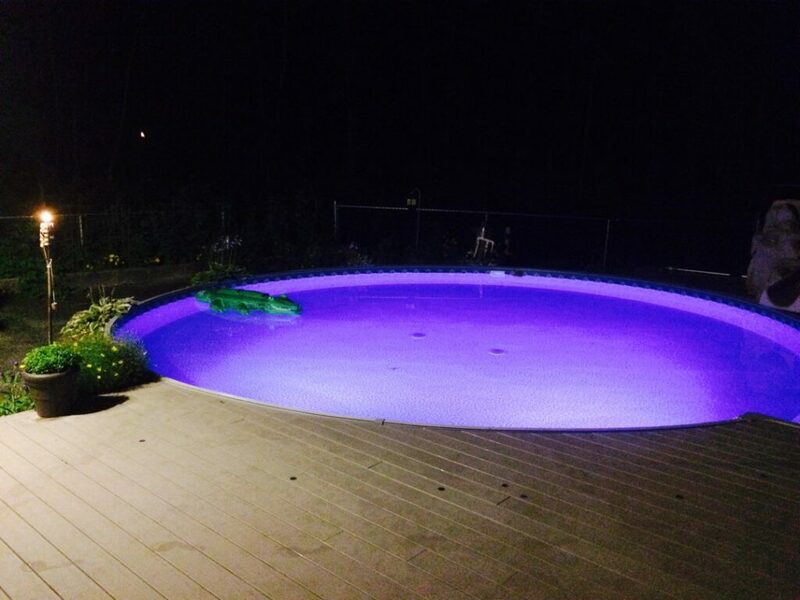 LED Lighting – White or colored LED’s create stunning effects at night in your pool. For more information on making your dream pool a reality, please visit our Radiant Pools page.